You could be an Abnegation, or you could be an Erudite. You could be Dauntless, Candor, or Amity. Or you could be Divergent. 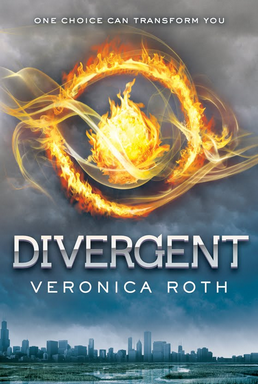 In the post-apocalyptic society of Divergent by Veronica Roth, each sixteen-year-old chooses his or her own fate. They can abandon their own faction along with the faction’s values, or stay within the faction. They will grow up with their factions, train, and can never change factions. Beatrice Prior is born in Abnegation, the faction that believes in selflessness and renouncing luxury. But she can’t play that part any more. When the Choosing Ceremony comes, she will make her decision and jeopardize the safety of her family. To gain membership in a faction, you must pass initiation. Being an initiate is hard. You train and overcome the obstacles thrown at you. You could end up paralyzed, dead, or worse, factionless — the hungry, homeless rejects of the factions. Through training, Beatrice discovers new things about herself. But dealing with the budding romance between Beatrice and her teacher is the least of her problems. She should belong to a different faction, the most dangerous one of all, the faction that is hunted and prosecuted: Divergent. On the horizon, a war rises between Erudite and Abnegation. Beatrice must decide whether to fight with her new faction, Erudite’s ally, or protect her kin in Abnegation. Kids everywhere will enjoy this chilling dystopian novel. A perfect blend of adventure and romance will have you on the edge of your seat. You can even decide on a faction of your own. Choose wisely!